Within the pages of this book will be found over 7000 entries, most of which have been filled with the names of the singers concerned and with the arias and songs which they sang. Some 4000 matrix numbers have been included, to present as complete a picture of the activities of the great Russian singers as is possible, from the early Berliners of 1899to the last names appearing in the catalogues of 1915. In addition, Dr Boris Semeonoff, an authority on Russian Records, has written an illuminating article on Reading Russian Records Labels, which should encourage collectors to unravel the hieroglyphics of the Cyrillic alphabet with the aid of a good dictionary, or, better still, learn the language themselves! Additional information: The following is the Introduction to John R. Bennett’s 1977 Russian Catalogues. It is undeniable that the Russian Catalogue represents the least known, but by no means the least important, of all the works in this series. Its remoteness is intensified by its language, which makes very strong demands on anyone but a fluent Russian speaker. It adds a new dimension to the task of the compiler, in that the cyrillic signs must of necessity be clothed in a more comprehensible garb. All previous “Voices of the Past” remain untranslated, and all operatic and song titles are accepted in the original. Even after translation there arise questions of uniformity in the text and its general acceptance into English. Translations from the Baltic languages and from Finnish have not been attempted; many of these have been copied down directly from indistinct or almost illegible sources. They are mostly of slight artistic value and offer no serious challenge to the richness and diversity of the Russian heritage. From the early Berliners of 1899 up to the end of the single-sides series in 1914/15, this listing of Russian gramophone recordings in the Black & Red label sections includes some 4000 matrix numbers – but it is not the end of the Russian story, in that there exists a very comprehensive set of Russian Zonophones and a quantity of six-figure Green Labels which may well form the basis of a fresh catalogue. It was in 1897 that records first made their appearance in Russia, stamped on the back as being: “Pressed in Hanover”. Two years later they were also recorded in Russia, the brothers Berliner marking the birth of the gramophone industry as we know it today. The discs were heavy and thick, with unpolished edges; the titles were etched directly onto the surface or stuck on the reverse side, together with the text or examples of the music. The very first copies were not uniform in size, but manufacturers soon settled for a diameter of 17.5 cms. No matrix numbers were included in these early recordings, but on some copies the dates were stamped into the material, at least from 1899. The artists signed their names into the wax. In 1897 Russia saw its first gramophone. In the Arcade on the Nevsky Prospekt a wide public made its appearance with the new invention. According to a price list of 1902 these first models were expensive : an apparatus with an extended winding mechanism cost 80 rubles; with a concert diaphragm and a large horn, 100 rubles; and with masterpieces of engineering like the ”Monarch-Grand” gramophone “with a horn of bright silver of hallmark 84” – the price was 600 rubles! Russian artists came to Hanover for the first time in 1897 to record their voices; as yet the techniques of sound recording were unknown at home. Two years later the Berliner brothers sent their master craftsmen Darby and Heinicke to St. Petersburg for recording voices on the spot. Among the first singers were G. A. MORSKOI, M. A. CHUPRYNNIKOV, I. V. YERSHOV, K. T. SEREBRYAKOV and others. The records which they made were quickly sold out, but some of their artistic colleagues regarded them with disapproval and disquiet. It was found that mechanical sound production interfered with the popularity of concerts, so that many prospective recording artists only agreed if they sang under a pseudonym. The enthusiastic supporters of “clean art” (in opposition to the “singing machine”) counted it even reprehensible to participate in anything but living performances. In 1900 the Russian singer N. N. FIGNER ceremoniously announced in the press that recording was a profanation of art – and such an opinion was indeed no exception. On the other hand, it is said that the great I. I. TARTAKOV was successfully persuaded to record his voice in 1897. Early in 1901 work began to equip the new factory being built at Riga. Prejudice against the gramophone began to diminish as CHALIAPIN and SOBINOV ventured to record their voices. Both of these young artists had already established a great reputation on opera house stages; the public demand for concert performances of these two great singers led in turn to a demand for gramophone recordings, and so Figner decided to follow their lead. Fabulous sums of from ten to fifteen thousand rubles were being paid for a number of songs, romances or operatic arias. It was in 1904 (sic) that A. D. VYALTSEVA, the “incomparable queen of gipsy songs” and a favourite with the public everywhere, presented her recorded voice to the world. Her records sold out immediately. This was just at the time of the conflict in the Far East. Vyaltseva’s husband, an officer in the Russian army, had been wounded, with the result that the artist cancelled here contract and set out for the front as a nurse. Unfortunately the career of this fine artist was ended by her premature death in 1913. Those were the days when Russian gipsy songs and gipsy romances were being performed in vast numbers by such eminent singers as n.v.PLEVITSKAYA, A. D. VYALTSEVA and VARYA PANINA. 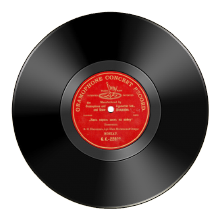 In the year 1907 a Frenchman named Guillaume Kemmler opened a special gramophone factory in Bakhmetevsky Street in Moscow. These instruments played their records in the reverse direction, from the centre to the edge, at a speed of 90 r.p.m. ; an iron needle replaced the soldered-in sapphire. The discs themselves caused great astonishment by their dimensions – they were half a metre in diameter! The sound grooves when seen through a microscope looked like a miniature ploughed field. These were models from the French firm of Pathé Frères. In spite of the novelty of the apparatus, it did nothing to diminish the hold on the public which the Berliner disc had built up over the years and which continued its expansion with the arrival of fresh artists, many of outstanding calibre. If one is inclined to look back over the many catalogues of this Company in many countries, it is evident that the galaxy of great singers found therein not only far exceeds those listed anywhere else, but also points to the unerring artistic and business acumen in selecting his soloists which Fred Gaisberg possessed. As somebody said once of him – “An artist among artists”. The listings below show those Russian recordings issued with Red labels. It will be noted that these labels were used only for vocal recordings.